Two children, 2 years old and 17 months old, nearly drowned in a backyard pool. Tanah Zuniga and her sister, Karly James, are counting their blessings after both of their toddlers nearly drowned in an above-ground pool in Zuniga's backyard just feet away from their mothers. 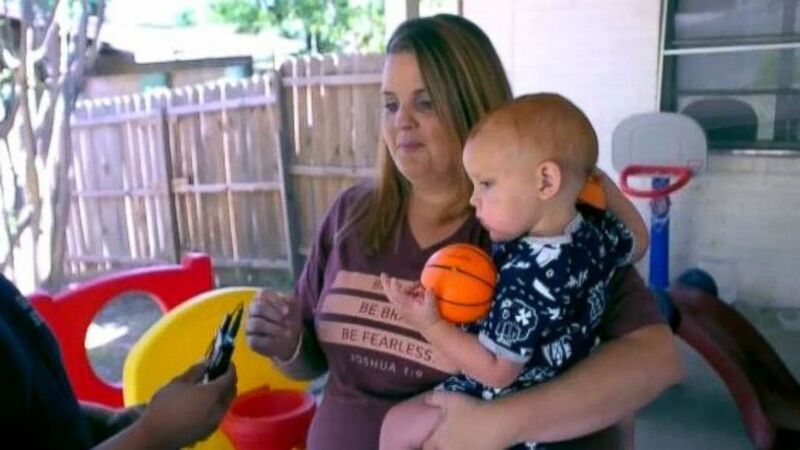 Zuniga and James were in the kitchen at her new Fort Worth, Texas, house last Monday when James' 2-year-old son and Zuniga's 17-month-old son somehow managed to unlock the back door and walk out to the pool. Surveillance video from Zuniga's backyard camera captured the frightening moments as the 2-year-old made his way to the ladder of the pool and climbed up -- followed by his cousin. The 2-year-old climbed right into the pool despite not knowing how to swim and the infant fell in behind him. The video shows the 17-month-old immediately go under, and James' son tries to pull him above water, but cannot. James' son gets out of the pool and wanders back to the house, at which point both mothers sprint out of the house and pull the infant from the pool as he is floating face down. (WFAA) Tanah Zuniga's 17-month-old son is seen being pulled out of the backyard pool on surveillance video. "It was the worst experience of my life. You never think it's going to happen to you," Zuniga told Dallas ABC station WFAA. Luckily, James had CPR training in the past and immediately began to try to resuscitate her nephew. "When we pulled him out of the water, he was already gone. He was completely blue. His lips were white. He was not moving. He was not breathing," said James. "All I knew was to give him air." The 17-month-old began breathing and coughing, but was still rushed to Cook Children's Medical Center. Zuniga said her son has made a full recovery and shows no signs of brain damage despite how long he was unconscious. (WFAA) Tanah Zuniga's 17-month-old son nearly drowned after falling into their backyard pool. The child was in the water for over five minutes, the surveillance video shows. "God brought my baby back. I truly believe that," Zuniga told WFAA. The two mothers hope their story will teach others not to take their eyes off their children for a second.